10 Years in the Making: Rosetta’s Philae Lander Touches Down. Comets are relics of an era that has long since passed. They formed in the same accretion disk that gave birth to our Earth, Sun and the rest of the solar system but managed to avoid being subsumed into a larger celestial body. This, along with the amazing show they put on whenever they come close to the Sun, makes them objects of particular interest to star gazers and scientists alike. However few craft have studied them as their highly elliptical orbits make it incredibly difficult to do anything more than a flyby. That is, of course, unless you’re the ESA’s Rosetta spacecraft which just made history by deploying its Philae lander to the surface of the Churyumov–Gerasimenko 67P comet. Many would have heard about the Rosetta craft recently as it was the first craft to ever enter an orbit around a comet which was achieved back in August. However few would know that it’s been on that journey for over 10 years as the Rosetta craft was launched in March of 2004. Since then it’s been slowly making it’s way to rendezvous with 67P, using multiple gravity assists to give it the velocity it needed to match the comet’s speed. Once it arrived at the comet it began imaging its surface in incredible detail, searching for a landing site for it’s attached Philae lander. In the early hours of this morning the Philae lander detacted from its parent craft and began its descent down to the surface and shortly after we received confirmation that it had touched down successfully. It’s not all good news unfortunately as whilst the telemetry indicates that the lander did make it to the surface the anchoring harpoons that are on it’s feet did not fire. 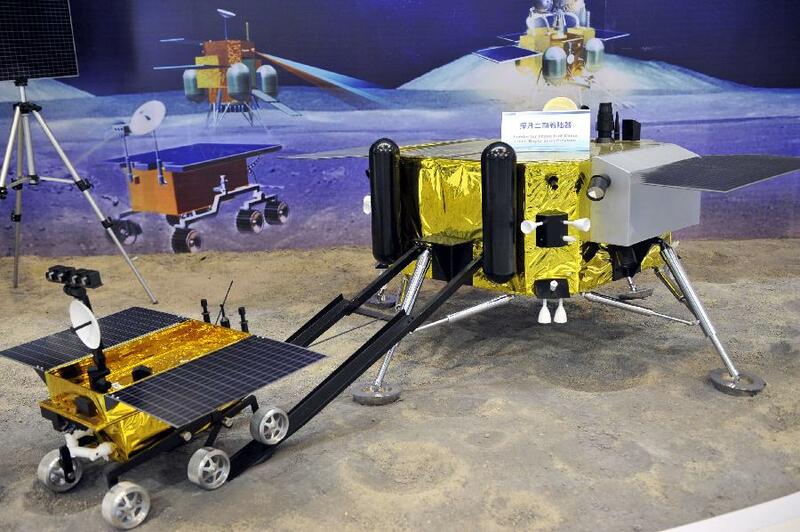 This causes two problems, the first (and most troubling) of these is that the lander is not securely fixed to the comet’s surface. In the minuscule gravity of the comet the lander weighs about 1 gram, meaning any out gassing from the comet could flip the craft over, or worse, send it tumbling out into space. Additionally those harpoons also contained instruments for measuring surface density, a lesser issue but still a blow to the project all the same. The ESA is currently investigating the reasons behind this and might refire them to ensure that the lander doesn’t get blow away. Firing the harpoons again is risky but the people behind the Rosetta program have never been one to shy away from potentially mission ending decisions. Back in 2007 they scheduled an incredibly low altitude pass by Mars, a mere 250KM above its surface, in order to correct its trajectory to be closer to 67P. The trouble with this though was Rosetta couldn’t use its solar panels during this manoeuvre due to it being in the shadow of Mars, forcing it to power down for the duration. The batteries on the craft were not designed with this purpose in mind however and so this trajectory correction was dubbed The Billion Euro Gamble which, thankfully, paid off. 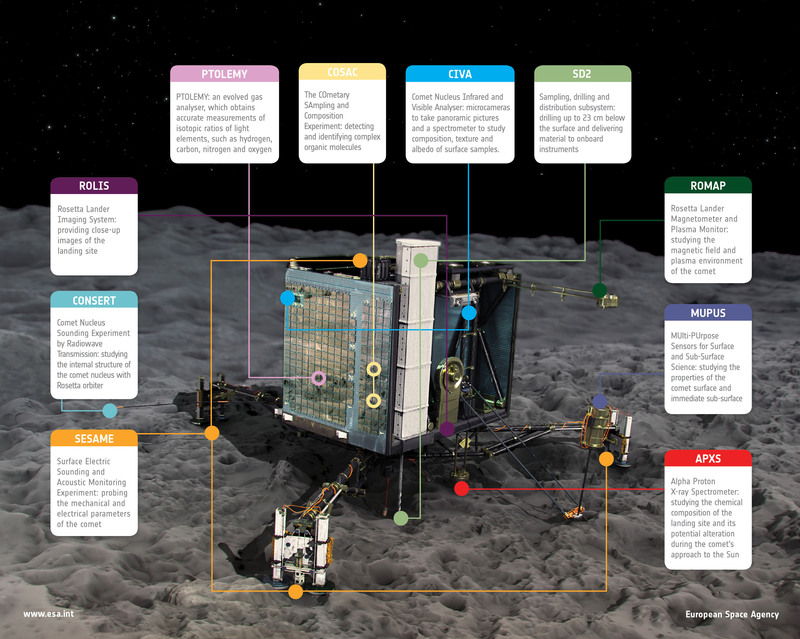 Rosetta and Philae both carry with them a host of tools designed to analyse the make up of the 67P comet including spectrometers, thermal imagers and radio/microwave based devices. The original spacecraft design was far more ambitious, including such things a sample return mission ala Hayabusa, however whilst it might not be as lofty a mission as it once was it’s still highly capable of giving us a detailed picture of what makes up this comet. This will then give us incredible insight into the early stages of our solar system and how it evolved into what it is today. Hopefully the harpoon issues will get sorted out in short order and the Philae lander can continue its work without the possibility of it getting blown out into the depths of space. Rosetta’s mission is slated to continue through to the end of next year, just after 67P buzzes passed us on its journey back out to the edges of our solar system. Like all good space missions there’s potential for it to go even longer and here’s hoping that Rosetta and Philae will continue to deliver long past their used by date.